The whitetail is unique to the Americas. There are 30 recognized subspecies in North America, and eight more in central and South America. The largest (and northernmost) is the O. v. borealis, while the smallest is the Key deer (O. v. clavium) of Florida. The whitetail is one of the smallest members of the deer family. Adult bucks range in weight from 75 to 400 pounds depending on subspecies, and stand 36 to 42 inches at the shoulder. 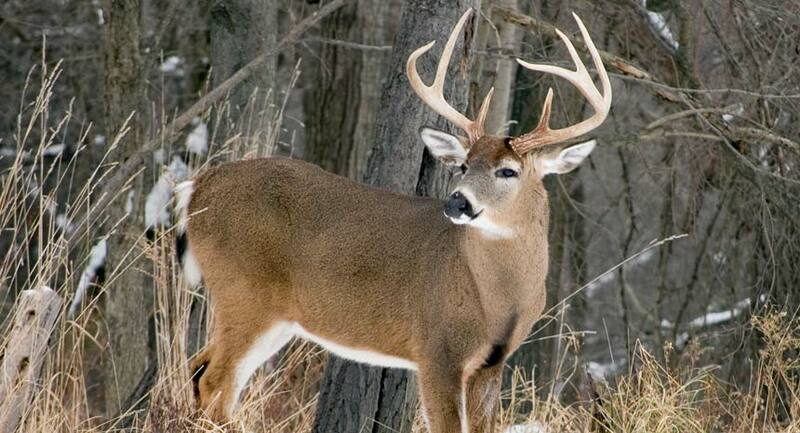 Only the bucks have antlers, which are shed annually. Typically, the antlers have two main beams which curve forward over the eyes, with tines that project up from it, as well as two guard tines over the eyes. Its large white tail, or flag, is a distinguishing characteristic. The coat is gray-brown and tends to be darker in southern wooded areas. Whitetail deer: a highly sought trophy. Habitat and distribution: Today, there are an estimated 20 million whitetails in North America. When Columbus landed there may have been twice that number. Between these two high points lie 500 years of heavy hunting and habitat destruction that reduced total whitetail numbers to approximately 300,000 by 1900. Strict game management and good habitat have helped whitetail make an incredible recovery. One result, however, has been a blurring of subspecies. Transplanting and interbreeding have homogenized the species, and only a few subspecies now exist which are readily distinguishable. One such subspecies is the Coues deer of the southwest, which is noticeably smaller in body size but featuring larger ears, and the tiny Key deer of Florida. The whitetail is found throughout North America, from Mexico to the tree line of northern Canada, and these deer are steadily expanding their range. In parts of the west, they are crowding out the larger mule deer. The whitetail is an animal of the mountains, the plains, the cornfields, the swamps, and the outskirts of major cities. They can be found almost anywhere there is decent browse and a patch of brush in which to hide. Here is a good illustration of the whitetail as a game animal: Some kid on a farm in central Michigan can step outside his door on a frosty morning with a single-shot 12-gauge in his hands, and he is deer hunting. A few miles away, a trophy hunter may be paying $12,000 for a week at The Sanctuary, looking for a new record buck. Both farm boy and well-heeled adult are after the same animal. This cannot be said for any other species. Without a doubt, the whitetail is our most widely hunted big game species. It is a subsistence animal, hunted by native people for food. It is a major trophy animal, and its antlers are highly prized. It is the animal most hunters seek near home each fall, whether for meat, antlers, or both. For many years, the number-one trophy head was the Jordan Buck, shot by Jim Jordan near the Wisconsin-Minnesota boundary in 1914. A major attraction is the fact that great trophies are where you find them. The new record deer that displaced the Jordan Buck in 1992 was shot in southern Saskatchewan by a meat-hunting farmer. This means the farm boy mentioned above is as likely to shoot a new record as a serious trophy hunter is. As you might expect with such a wide-ranging animal, the whitetail is shot under all kinds of conditions by all kinds of hunters using all kinds of strategies, tactics and equipment. Many books have been written on the subject. In fact, there are likely more books on hunting whitetail than all other types of North American big game hunting combined. Whitetail deer are found near good browsing and bedding areas. There are, however, some general rules. First of all, you need to grab one of the best deer calls or you won’t have a chance. Second of all, the whitetail is by nature nocturnal. It typically feeds around sundown or just before dawn. These are the times of the day most deer are killed by hunters. In daytime, the deer lie up in tight brush, go deep into the swamps, and otherwise make themselves scarce. Successful hunting is based on being where the deer are when the deer are there. You must also be sure to see the deer before the deer sees you. Sounds simple–and it is. The difficulty lies in the execution. Check out our helpful guides below on the best deer hunting gear.